Stay tuned for Facebook Live programming all day on the International Day of Zero Tolerance for Female Genital Mutilation (FGM)! Listen to activists, survivors, young people, journalists and health experts speaking throughout the day about the reality of FGM and what you can do about it. Watch live at facebook.com/UNFPA on Monday, 6 February. 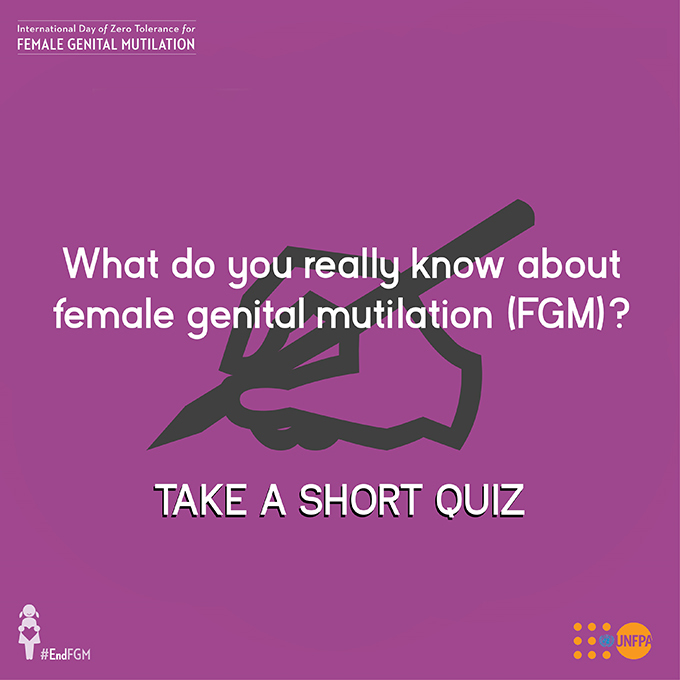 How much do you know about FGM? FGM is internationally recognized as a human rights violation. UNFPA, jointly with UNICEF, leads the largest global programme to accelerate the abandonment of FGM. Help spread the word about FGM and the need to abandon this human rights violation! Share facts, testimonials, videos and articles about FGM with your friends and networks.